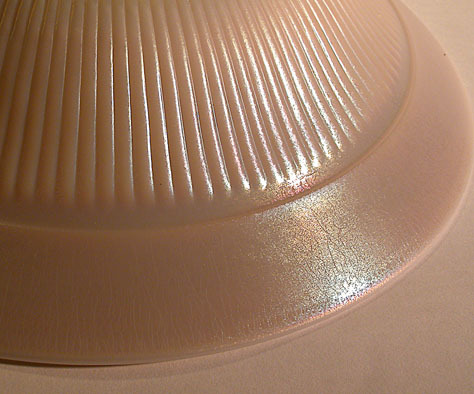 This line is hightly popular with carnival and stretch glass collectors because of the close-spaced ribs on the outside surfaces. There are many #900 pieces known in uniridized glass. The stretch ones are usually green or blue. Some rare marigold on milk glass pieces are also known. A large comport in various forms, a candy jar, bowl, plates, pitcher & handled tumblers, a creamer & sugar set, and a candleholder-vase are the pieces known in stretch. Closeup of marigold on milk bowl. #900 bowl, flared, in marigold on milk. 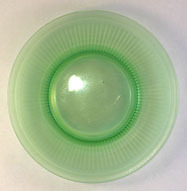 #900 bowl, wide base, raised rim, in green (5 1/4-inch base, 8 7/8-inch wide, 4-inch high). #900 comport, rolled rim in marigold on milk (made from #900 candy jar base). #900 comport, raised and flared, in blue (4 3/4-inch base, 9 1/2-inch wide, 4 3/4-inch high) photo courtesy J. Madeley. #900 comport, flared, in marigold on milk (4 3/4-inch base, 11 -inch wide, 5 1/2-inch high) photo courtesy J. Madeley. #900 comport, flared, in blue (4 3/4-inch base, 11 1/4-inch wide, 5 3/8-inch high). #900 comport, rolled rim, in green (4 3/4-inch base, 11 1/2-inch wide, 54 3/4-inch high) photo courtesy J. Madeley. #900 comport, rolled rim, in blue (4 3/4-inch base, 11 1/2-inch wide, 5-inch high). #900 comport, flared and cupped, in blue (4 3/4-inch base, 11 1/4-inch wide, 4 3/4-inch high). #900 comport, flared and cupped, in green (4 3/4-inch base, 11 1/4-inch wide, 4 3/4-inch high). 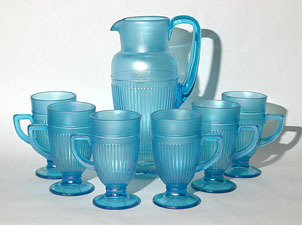 #900 pitcher and mug set, in blue (pitcher: 3 1/2-inch base, 9 7/8-inch high; tumbler: 2 5/8-inch base, 2 7/8-inch wide, 5-inch high). #900 vase, in blue (3 1/2-inch base, 4-inch wide, 9 3/4-inch high). #900 candy jar in blue (3 3/8-inch base, 3 3/4-inch wide, 8 1/8-inch high). #900 sugar & creamer set (sugar: 2 3/4-inch base, 3 1/2-inch wide, 2 3/4-inch high; creamer: 2 3/4-inch base). #900 candleholder/ vases in blue (2 1/4-inch base, 7 3/4-inch high). #900 candle- holder/ vase in green. #900 plate in blue (4 1/4-inch ground base, 8-inch wide). #900 plate in green (8-inch wide).